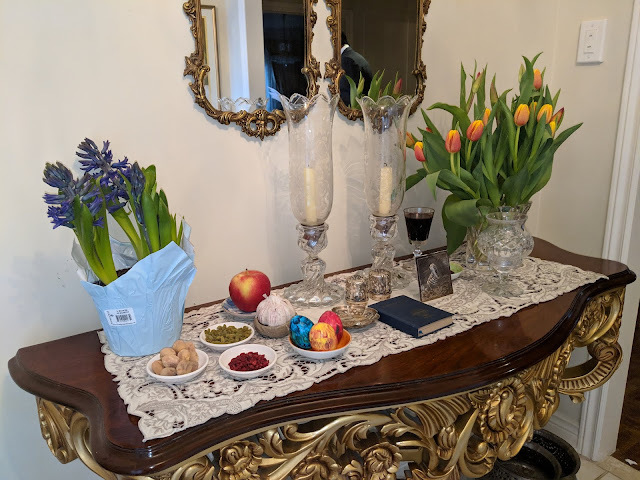 Navroze is a celebration of good health, happiness and prosperity, thought to be celebrated by over 190 million people worldwide, particularly by those from the Middle East and Central and South Asia. The Haftseen table is a symbolic tribute to the seven creations of the universe; fire, water, air, earth, metal, the plant and animal kingdom. It thanks the universe for what we have and pray for continuity in the days to come. It is called Haftsheen or Haftseen, where 7 items start with the sound 'S' or 'Sh' are placed on the table alongside other symbols. The table usually features candles, a mirror, coins, flowers, painted eggs, nuts and dry fruit, and gold fish in addition to the main 7 'S's. 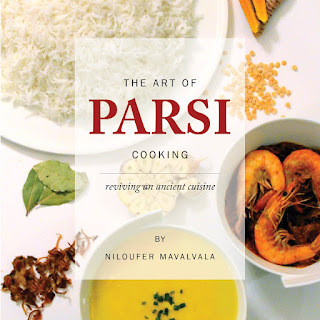 Originating in the Persian Empire centuries ago when King Jamshed the Great declared this day as Jamshedi Navroze, the table continues to be a tradition in modern-day Iran, and other Middle Eastern and Central and South Asian countries, and of course amongst their diaspora around the world. The table and its offerings are a celebration of life. A thanksgiving for the abundant creations of nature and the universe, and a reflection on and appreciation of the beauty of all things around us. The Western world in its own small way of recognition has declared this date as Poetry Day and United Nations Day. Some refer to it as International Day of Happiness. I am guessing this date its not quite the same for the people in the Southern Hemsiphere, where its the Autumnal Equinox. But, hey you can't possibly have it all. There is always an exception to every rule. My HaftSheen Table with the sharab/wine was for entertainment, siir which is garlic, sikka which is the coin represents wealth, saeb the apple, sonbol the hyacinth plant life, rosewater, While the mirror reflects creation and remembering to look at one self and smile while making a wish for the upcoming year. The prayer book and candles placed for each member of the family. Milk was placed for nourishment while a box or a shemshad represented wealth. A goldfish /Pisces placed in a bowl of water represented the end of our astrological year . In ancient Persia people also floated an orange in a bolw to represence the earth as part of the universe. It has been centuries since the Advent of Spring was marked universally. A program called 'sharing and caring' has been set up to create an awareness of our heritage and traditions. Preparing home made sweets to share with neighbours.